The FlexPort Universal Interface models FP-2U, 4U and 8U include all the features you would expect from an interface plus so much more. A leader in innovation, quality workmanship and design, all backed by a knowledgeable and friendly technical support team, the FlexPort line offers ease of use, reliability and helps eliminate downtime. Connecting to any brand or type gage is a given. Flexibility is the control you have over your gages and how it benefits you. We take flexibility and control to the next level. The many advanced (and exclusive) features of the FlexPort line allow it to adapt to any application. The FlexPort Universal Interface can collect data from a wide variety of digital gages such as Mitutoyo, Mahr Federal, Starrett, Ono Sokki, Fowler and more. Using industry standard cabling these gages plug directly into the FlexPort and send readings to the PC or PLC. Visit our cable website (www.gagecables.com) to find the cable you need. The FlexPort Universal can capture and analyze output from serial devices as well. Output is captured and buffered in the FlexPort. Up to 10 individual readings can be extracted from a single output string. Send any number of readings to the PC for accurate data tracking. The FlexPort Universal even lets you use host commands to communicate directly to your serial device for part change or setup requirements. Mix and match gage types side by side. The ability to collect data from virtually any device gives you the power to use the instruments you need. The FlexPort simultaneously combines the signal from multiple tools and converts it to a standardized format for tracking by any software you choose. (Most SPC software packages have a driver for this format already). The power of the FlexPort Gage Interface line gives users complete control over the data that is collected. The FP-2U, 4U and 8U offer 3 ways to request a reading to be sent to your PC. A data send jack (contact closure), the send button (on the gage) and host commands from the PC can all be used to request readings. All requests can trigger a static or dynamic (TIR) reading, trigger all or any combination of ports, send serial requests to a gage, notify PC that a data request has occurred and many more features exclusive to the FlexPort line. The front panel includes multiple data send LED’s to signal successful data sending. The LED’s turn on when data is requested and automatically turn off when data has been sent. Combine multiple FlexPorts together to create up to 99 inputs to meet your needs. This port (DB9M) can also connect directly to a serial gage and extract 1 to 10 readings from the output. The standard cable used to connect to the PC will combine all MidwestFlex products (digital, serial, analog, display, and more) for up to 99 inputs. 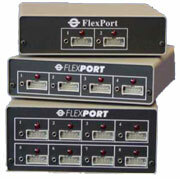 The capabilities of the FlexPort Universal Interface line have expanded over the years with too many features to list. As users have requested new features and functions, we have listened. The FlexPort can be used right out of the box with plug-n-play ease or be configured to meet the needs of the most demanding measuring process. Call Midwest FlexSystems, Inc. to discuss your application today and see how the FlexPort Gage Interface can best fit your application.